“Anchoring” is a cognitive bias where people give excessive weight to initial pieces of information. In the context of negotiating deal terms, this means that parties overemphasize the first numbers and terms in a term sheet or definitive agreement. For example, during the creation of a joint venture between an established global company and a partner in an emerging market, the global partner provided an initial term sheet with terms that were not favorable for the local partner. The local company did not counter with what it believed the terms of the deal should be. Instead, it only slightly dialed back the proposed terms. It did so for two reasons: first, it wanted to signal a commitment to the deal, and second, it believed the proposed terms were appropriate because they were included in a terms sheet provided by a sophisticated party. This latter rationale shows that the local company anchored on the terms in the global company’s proposal. In deal restructurings, there is a dual “status quo.” One is the terms of the original deal being restructured. The other is the set of terms offered in the first draft of the term sheet, amendment, or other agreement documenting proposed changes. Both of these will anchor and influence where the parties end up on key terms. The status quo plays a pivotal role in operating joint ventures in three situations: (1) in day-to-day operations where certain changes from the status quo require approvals so the status quo remains, (2) when some action or trigger (e.g. a deadlock) requires the parties to maintain the status quo, and (3) when the joint venture agreement does not address a particular situation so the status quo prevails. In general, JV management or the operator of a venture cannot make significant changes to the scope, business, or assets of a joint venture without obtaining prior Board or owner approval. The threshold for when Board or owner approval is required will vary from venture to venture, but almost all joint venture agreements specify that the Board or owners must approve material changes in the venture’s business, significant acquisitions or dispositions of assets, ownership changes, and other significant changes to the venture. Therefore, on a day-to-day basis when the Board or owners are not present, the venture must operate within certain bounds. In other words, it must maintain the status quo or something near it. Once management or the operator has elected to make a significant change to the business, it must seek approval of the Board or owners as specified in the joint venture agreement. 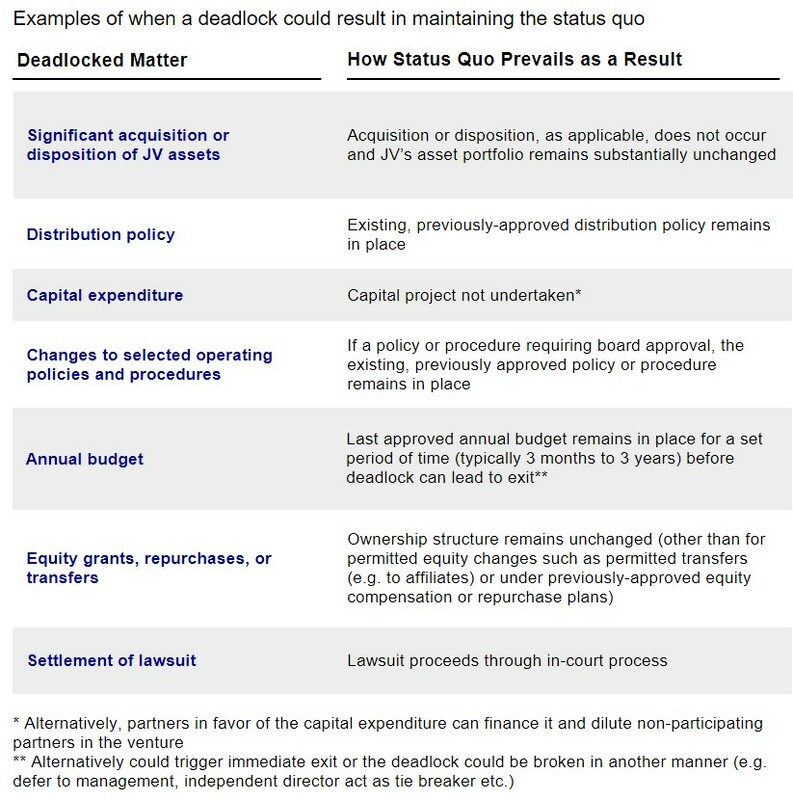 If the Board or owners are deadlocked and unable to come to a decision or approve a change, often times the default is that the proposed change does not occur and the status quo continues (Exhibit 2). Continuing the venture in its current state is just one of many potential results of a deadlock; others include arbitration, escalation to executives in the parent companies, exit if a disagreement persists, or allowing one or more partners to take the disputed action without others and dilute the non-participating partners. For “minor” deadlocks that are not fundamental to the overall direction of the company, reverting to the status quo is a common and acceptable approach. For instance, in an oil and gas joint venture owned by seven partners, most of which were global players, the Board disagreed on whether to approve a new project proposed by management. In this situation, the status quo prevailed, and the venture continued without undertaking the new project. In other situations, a deadlock may cause the status quo to persist on a temporary rather than permanent basis. By way of example, a joint venture agreement could provide that if an annual work plan and budget is not approved, the last approved work plan and budget will be renewed for a period of time (e.g., one year) and only then, if the parties have not resolved the deadlock, one or more partners can exit. As a result of these deadlocks, the ventures retained the status quo. Other deadlocks that result in the status quo remaining in place might not relate to significant changes proposed by management or the operator, but instead to matters typically handled by the Board. Take approval of dividends as an example. A typical joint venture agreement requires super-majority approval of distributions to shareholders meaning that a minority shareholder could block a distribution if it preferred for the venture to retain earnings and invest in growth projects. In other words, the money remains where it is – in the venture. This continuation of the status quo can be detrimental to partners who are in the venture for near-term financial returns or who want to deploy capital from the venture to other areas of the parent company’s business. Once a venture is up and running, it may become clear that the joint venture agreement did not contemplate all possible terms. When legal agreements do not address how a particular topic will be addressed, the law fills in the gaps with a default term. In the context of joint venture agreements, this default term is often that the status quo persists unless all parties to the agreement agree otherwise. For example, in a joint venture between two large chemical companies, the joint venture agreement lacked any exit provisions except in the case of a material default by one party or another. Over time, the partners’ views on the way the venture should be run diverged and one partner wanted to exit. Because the partner did not have a right to exit, the default was that the status quo prevailed and the parties would remain partners unless they both agreed otherwise. This left the party seeking to exit with three unattractive options: remain in the venture, offer an extremely high price to buyout its partner (assuming the partner would accept a high enough price), or offer to sell its interests at an extremely low price (assuming the partner would buy at a low enough price). In this case, defaulting to the status quo worked to the detriment of the party seeking to exit. Overall, the result of the status quo playing a large role in the initial setup and life of a venture can be that partners end up “trapped” in a venture where they have agreed to less than favorable terms or where they cannot influence the venture’s operations, despite not being satisfied with the current workings of the company. Such traps can be financially detrimental to partners. Furthermore, disagreements regarding whether the status quo should continue can fuel animosity among partners. While it is impossible to completely avoid these traps, with appropriate planning, parent companies can minimize the bite of the status quo.